Earlier this season, we went straight to the source and asked several professional mechanics for their advice on chain maintenance. The result was an Ask the Mechanics wrenching clinic from some of the sharpest tools in the team tent. For this round of Ask the Mechanics, we wanted to focus on shifting systems. 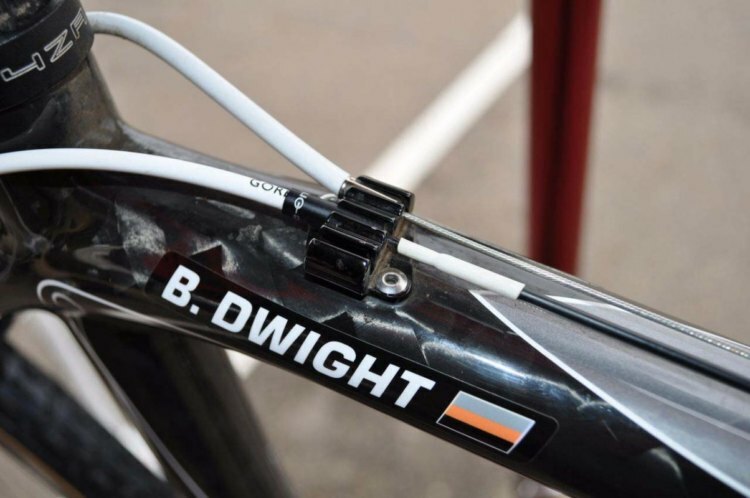 Poorly maintained shifting can ruin a race, and with a lot of small parts and more and more bikes hiding cables inside the frame, there is a lot to keep on top of with cable systems and it is not all easy to see. Cable and housing maintenance is important for consistent cyclocross performance. © Clifford Lee / Cyclocross Magazine. We asked Mark Legg (KFC Racing p/b Trek/Knight Composites), Brandon Davis (Aspire Racing), and Mike Berry (Cannondale p/b Cyclocrossworld.com) to reprise their roles as resident experts, and we also enlisted Eric Takayama, Bay Area mechanic and owner of CYCL-OLOGY (email: cyclology.us [at] gmail.com), for his opinions as more of a “working man’s” consultant. Responses from Davis, Berry and Takayama are given in rapid-fire form. 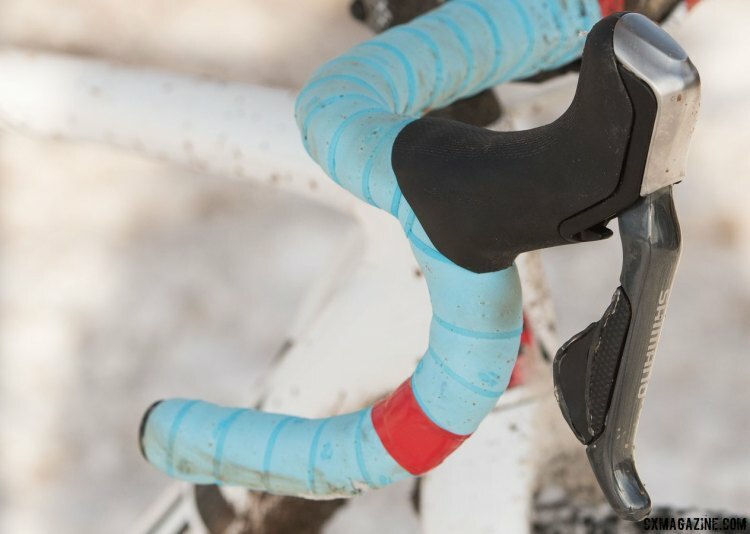 Katie Compton has been riding a Di2 system for several years now, so Legg commented in full on running electronic shifting, and he also provided some insight from when Compton was running a mechanical system. 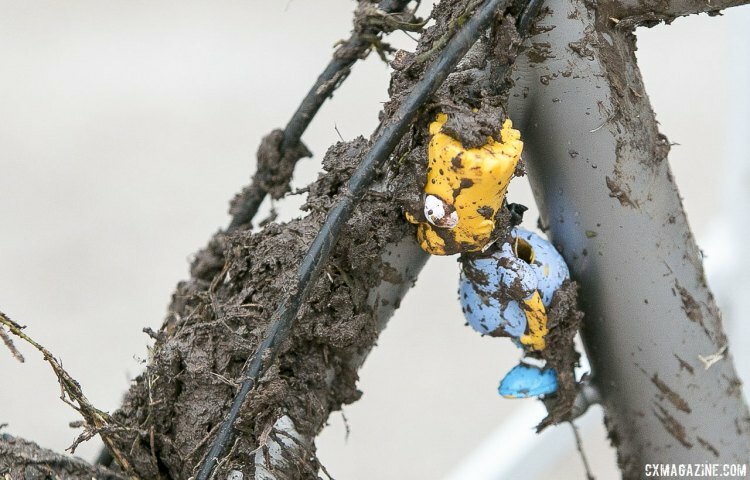 CXM: How do the demands of cyclocross affect the approach to cable maintenance? 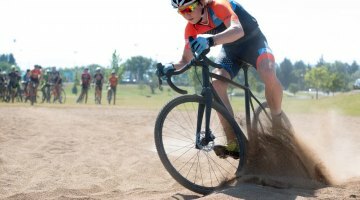 Brandon Davis: Cyclocross will do a number on equipment and the harsher the conditions, the more frequent the maintenance from cables to brake pads to bearings and more. It all gets replaced after a gnarly race in mud or wet sand. Mike Berry: With increased washing and muddy conditions, keeping the cables moving free is important to proper shifting. Entry and exit points are important to keep clean and free of debris. Eric Takayama: Here in NorCal, cyclocross is usually dry and dusty for two-thirds of the season, but quite a few races are like mountain bike short tracks, requiring a lot of hard shifting and braking. Regardless of the weather, that kind of riding takes a toll on cables and housing. For bikes with mechanical shifting and braking systems, weekly maintenance is a must and I check for signs of wear on exposed housing and cables, and contamination around ferrules monthly. CXM: During a cyclocross season, how often are cables replaced and housing re-used, and how often are both replaced? Do you do everything as needed, A and B bikes at the same time, or is it more frequent for starting bikes than pit bikes? BD: Cables get replaced on both A and B bikes fairly frequently. We race both bikes an equal amount and do maintenance at similar intervals, but ultimately conditions dictate more often than not. That said, everything is fresh going into major races like Worlds, Pan-Ams and Nationals. Generally, if we have to replace cables then housing gets done at the same time. A great general rule for people is if you are doing fresh bar tape, then do cables as well. MB: We replace cables as needed on a per-bike basis and will determine housing contamination at that time. 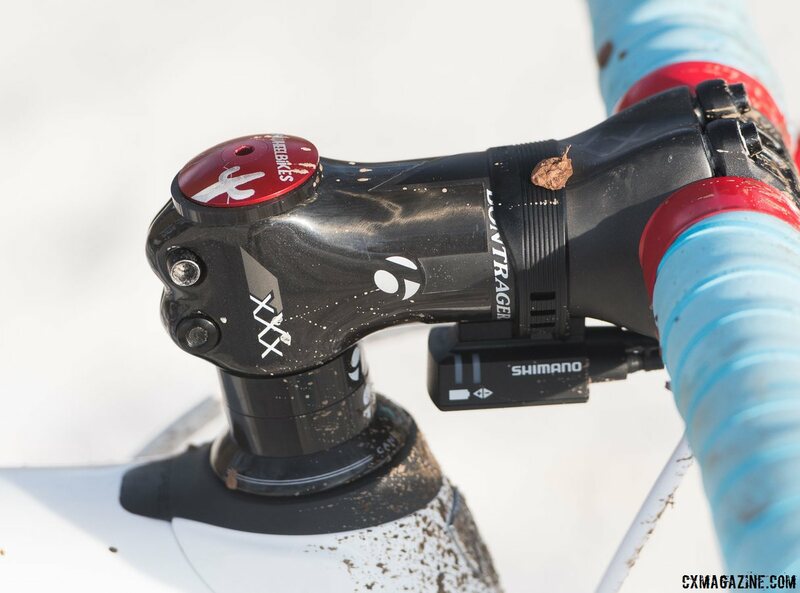 With the Cannondale SuperX, the housing is full-length from the shift lever into the headtube, across the top tube and down and out the seat stay into the rear derailleur. Because of this full-length housing, we rarely need to replace the full length of housing because the majority of the cable stays contaminant free with only one entry and exit point. Occasionally the very end of the housing will get contaminated with dirt and can be trimmed short to eliminate that. ET: I see my clients’ A and B rigs in July for preseason prep, which includes new cables and housing. Under normal NorCal conditions, the cables and housing can last an entire season. Depending on conditions and a client’s budget, I might replace only the cables on frames with internal-routing. During last year’s epic rain, I replaced full and internal housing on some clients’ A bikes mid-season due to contamination. CXM: What is the usual service interval? Is it a monthly thing, or do you only touch it if there’s something wrong, or based on weather/course conditions? BD: The team doesn’t have a strict service interval. 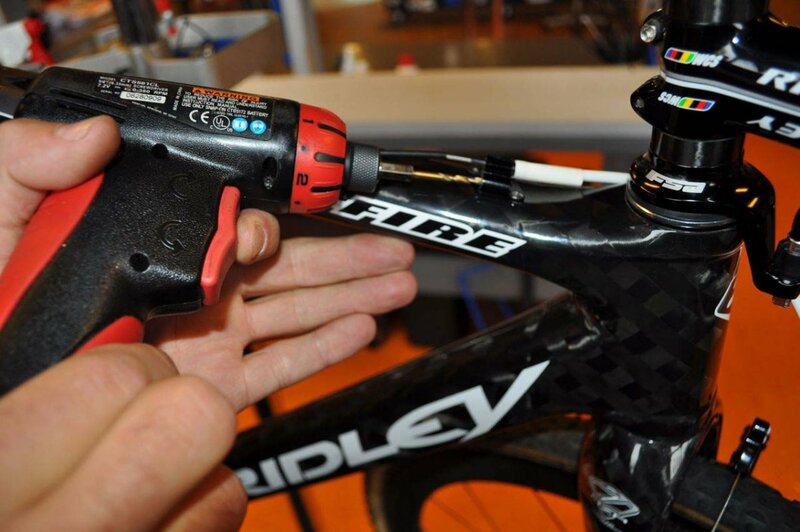 We inspect the bikes after each race as well as before to monitor wear and tear and note any delay in shifting. Usually, cable problems present themselves as a delay in shifting down the cassette. In that case, typically the coating on the SRAM cables we use has simply worn out and is creating drag in the system. Typically after really gnarly conditions, that could compromise the integrity of the shifting and we will replace cables as any degradation in shift performance can translate to poorer race performance. It’s simply not worth it to not replace the cables, especially with how cheap cables are relative to every other wearable component. The best thing you can do for your bike is to regularly inspect, clean and replace cables. MB: We replace cables and housing as needed. The team bikes get scrutinized daily and any issues are resolved during that time. If it’s not an issue, it will not be replaced. There is no need to introduce new issues on a bike that is working perfectly. 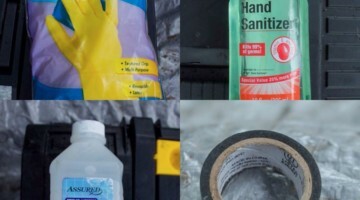 ET: If you’re racing, you should inspect and maintain your equipment weekly. Almost all of my clients race ’cross, road or triathlon, but they usually bring their bikes to me just once a month during the season. While I’d like to maintain their bikes every week, the reality is most of my customers are fairly self-sufficient and tend to see me when there’s something they don’t want to do themselves. CXM: What kind of housing do you use? 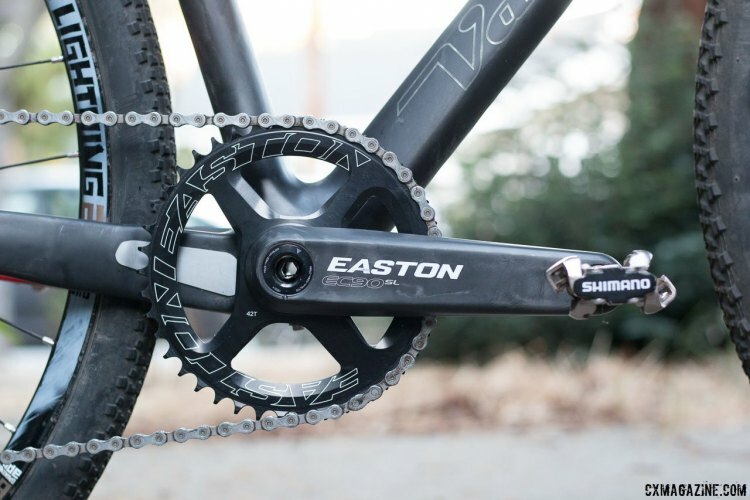 Do you match the brand to the drivetrain or use something third-party like Jagwire, Nokon or an old Gore kit? 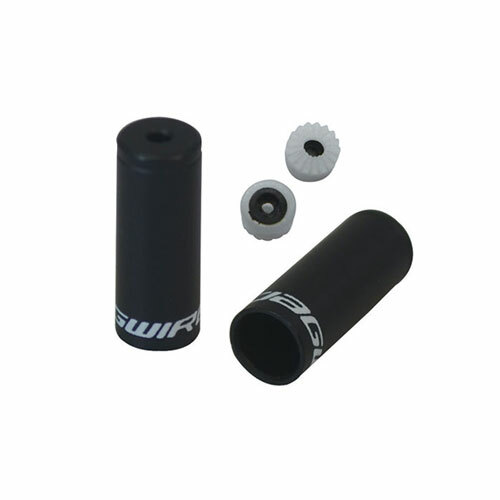 BD: We use the SRAM Pro Shift kits that utilize a sealed system via their liner. They are similar in design to the old GORE kits that everyone loved back in the day. MB: We use SRAM housing and cables on the team bikes. For cyclocross, I recommend any system that is sealed from entry to exit. 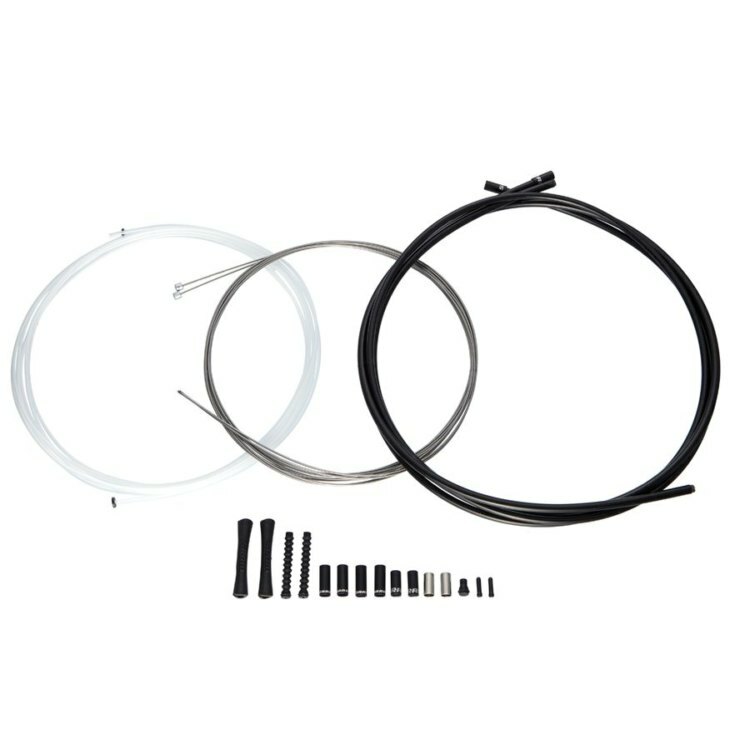 SRAM Slickwire Pro sealed cable kit is as close to the old GORE cable systems as is available today. ET: I’ll use the OEM housing kits that come with components, otherwise I stock Jagwire LEX-SL, which is a lube-lined linear steel shift housing, and Jagwire CGX-SL, which is a lube-lined steel coil brake housing. Both are equivalent to the OEM stuff. An exception is Campagnolo-equipped bikes, which always get Campagnolo-branded cables and housing. I used GORE shift and brake kits before they went out of business, but I didn’t get many requests for sealed systems, probably because of our climate and their cost. I would never use a linked housing like NOKON for cyclocross. It’s too difficult to set up and maintain on a ’cross bike. If a client wants a lightweight, high-performance housing, I’ll usually equip AICAN (from Taiwan) Kevlar-reinforced, linear steel strand shift or brake housing. It’s pretty expensive for the 40% weight reduction, but if you have 10+ feet of housing running through your frame, it might be worth it to you. CXM: What about the cables themselves? 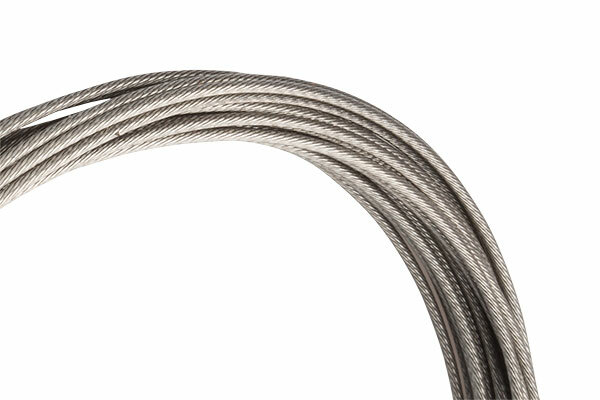 Do you use a stainless cable or one of the coated options from Shimano, SRAM or Jagwire? BD: We use coated SRAM cables, but at minimum, you should use stainless cables and keep them clean. Even when you first get a new stainless cable take a rag and some WD-40 and clean the manufacturing residue off the cable. Never use galvanized steel cables. They just aren’t able to withstand the rigors of cyclocross. MB: We use the PTFE-coated SRAM Slickwire 1.2mm cables. They work best with the SRAM Slickwire housing. ET: I prefer to keep cables and housing brands matching. 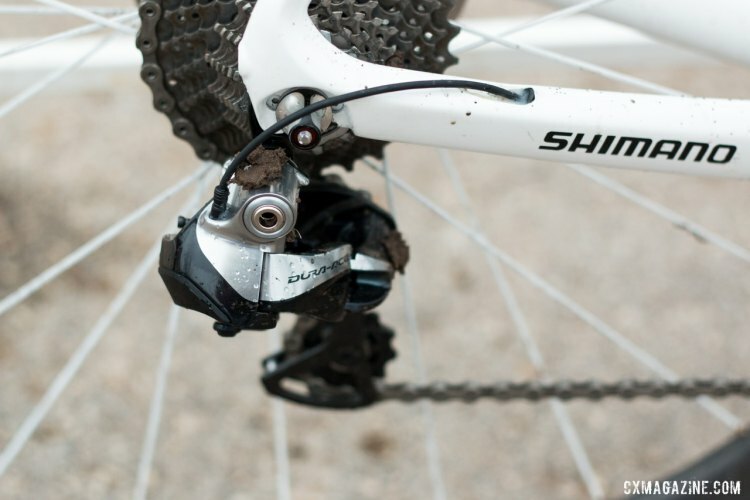 Shimano designed their housing to be used with their polymer-coated cables and SRAM has a similar system. Otherwise, I use 4 and 5 mm polished stainless steel cables, often in 3,300 mm length since most bikes have internal routing nowadays. The black, Teflon-coated after-market cables are kind of a gimmick in my experience and I never recommend using galvanized steel cables due to their poor corrosion resistance. CXM: Do you lubricate cables? If so, with what? How often? BD: Lubrication will attract dirt and grime so we don’t use lubes, we just replace the cable. MB: We do not lubricate cables. We will put a small dab of grease on the cable head as it goes into the shifter to prevent any binding at the cable head, but nothing in the housing or on the cable itself. Coated cables should be run dry, lubricant just increases the chance of bringing contamination back into the housing. Lubricants also change consistency as it gets colder, causing shifting to become sluggish as it gets near or below freezing. ET: All the housing I use is pre-lubed, so I don’t lubricate cables. If the shifting and braking systems are set up properly with sealed ferrules and their liners are intact, then adding lube externally just invites dirt. Some of my most common repairs are bikes with contaminated drivetrains and housing due to excessive lubrication. CXM: What type of ferrule do you use, open or sealed, with or without the wiper straw? 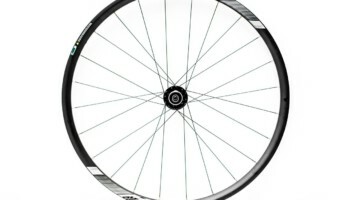 BD: As I said we use the SRAM Pro Shift kits, which have a liner system. MB: We use an open ferrule at the shifter end and a sealed ferrule at the derailleur end. ET: I use and recommend sealed ferrules throughout a ’cross bike, either the nickel-plated brass ones with removable wipers or the plastic ones with a molded straw.  CXM: Do you use any additional cable seals? BD: Nope, the SRAM Pro Shift Kit is one and done whether you’re running a 1x setup or a double. 1x folks get the two-for-one deal. MB: Due to the cable routing on the SRAM Force 1 rear derailleur, there is not a way to use a long seal, wiper or “grub” seal, so the sealed ferrule works best at that end. The non-sealed at the shifter end reduces drag on the cable. ET: Not really. For the occasional split cable, top-tube routing I see, I may use black PTFE liner on the exposed cables to protect the frame’s finish. It does a better job than the little rubber donuts and helps keep sweat from traveling along the cable and into the ferrules/ housing. CXM: How does full housing impact setup and maintenance? BD: Our setup is a liner setup, but on my home bike I drilled out the cable stops to run one full piece of 4mm housing to have a more robust sealed system. I don’t like to work on my bikes after meticulously dialing bikes in all weekend at races. MB: The Cannondale SuperX has full housing and does require a bit more planning during assembly. Fishing the housing from the rear to the front and twisting as we go to get around the bend at the seat stay-seat tube junction helps. To facilitate the initial assembly we do this without the fork installed because it’s easier to fish the housing through the port in the side of the headtube without the fork in the way. 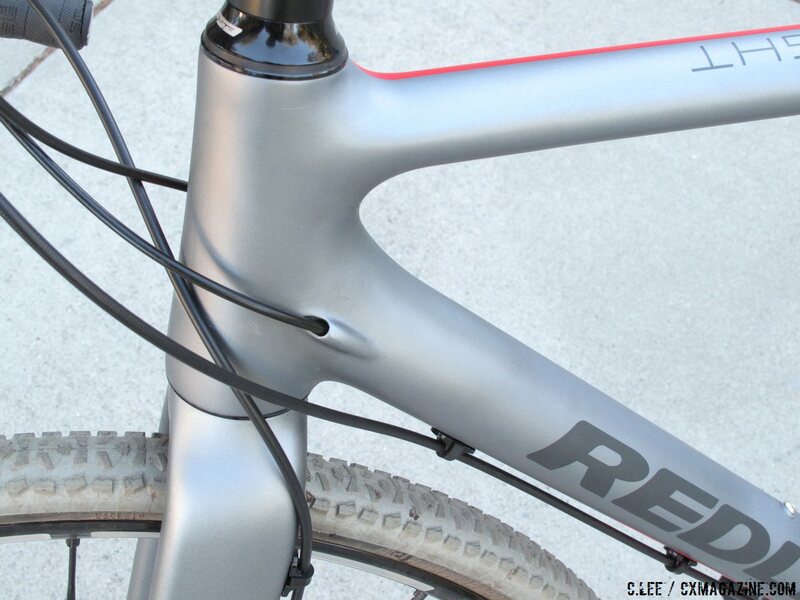 ET: If full housing—and internal housing in particular—isn’t installed properly, it can cause cable drag or binding. When properly set up and cared for, full housing can extend the performance of cables and housing significantly and reduce maintenance. The downside for my clients is that most of them need my service just to replace a cable. For builds or overhauls, routing full or internal housing and cables adds significantly to the cost due to the extra time and material involved. CXM: How are 1x systems different from doubles, other than one less shifter? Do you see a difference in cable life and does they require special attention? BD: Not really any different in regards to cable setup, but I do notice with the SRAM 1x setups, the drivetrain seems to wear more evenly due to utilizing the full range on the cassette unlike a double where you tend to hang in a section of the cassette more often and shift the front. I will say that SRAM 1x cable tension setup is super easy to dial in and once the initial cable stretch is done, it’s virtually set and forget. Just keep the system clean and well routed and it will do its job day in and day out. MB: No special attention is needed for 1x versus 2x systems, just one less cable. Typically 2x systems won’t have full-length housing and will require a cable liner, so the more entry and exit ports you have, the more potential for contamination to enter the housing. This makes the use of the “grub” seals important. It’s also important to look at those liners. Some cables will groove the liner and cause it to crack prematurely, especially under the bottom bracket. ET: Front derailleurs need a lot of TLC in ’cross because even a little contamination will eventually lead to sloppy shifting. Usually, the cable and housing are less to blame than worn parts. People mistakenly increase cable tension, yet overlook chain and ring wear, to fix poor shifting into the big ring. Cranking up the tension can fray the cable or rupture old housing, resulting in degraded shifting. Additionally, the internal routing trend has made it harder to set up and service front derailleurs. Badly designed internal routing or poorly installed full housing can really affect front shifting performance. CXM: How are brake hoses are maintained and replaced? Is it in line with cable service or is it addressed separately with brake pads? BD: Brake systems are their own beast. We stay on top of pads and keep fresh fluid in the lines so the ride is consistent and lever feel is solid and reliable without brake fade or uneven modulation from front to back brake. If any part of the system feels off, then new pads and a brake bleed are definitely done first and all components inspected in the process. MB: Hydraulic brake hoses are inspected with the rest of the bike, looking for cuts or abrasions that could potentially be a problem. Hoses are replaced as needed if anything is found that could be an issue. With internally run hoses, there is little exposed to get damaged. ET Hydraulic brake hoses are on a separate maintenance schedule from mechanical cable and housing. I’ve only replaced hydraulic hoses due to length, not wear or defect, luckily. 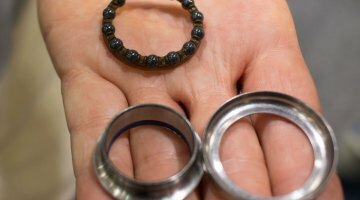 We also reached out to Mark Legg, mechanic for and husband of Katie Compton. 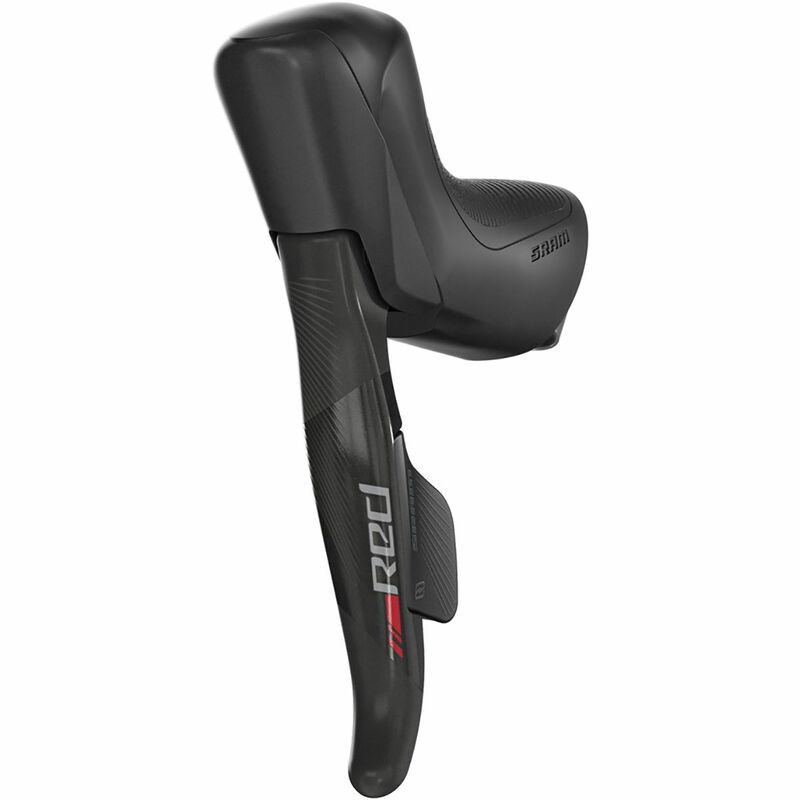 Since KFC Racing has moved to Shimano Di2, many of our questions did not apply. Legg, however, did have a lot of insight about maintaining shifting systems within the context of cyclocross picked up from over a decade of maintaining Compton’s race bikes. His response is below. We run Shimano Di2. No cables are needed. A perfect shift is only “a mouse click” away. When we were running cables, I ran a sealed system for both brakes and derailleurs. I started running sealed systems way back when Katie won Cyclocross Nationals in 2004. I’ve run various systems over the years, but it mostly developed into a cobbled-together system of bits and pieces I liked. When GORE came out with their sealed system, I wasn’t happy with the inner cables so I used Shimano inner cables. I continued to use Shimano inner cables until we switched over to Di2 electric because Shimano cables have very little stretch under load compared to the rest of the cables available. Campagnolo inner cables were also a favorite, but the cost was too much for me. When SRAM came out with their adaptation of the GORE cables, I really liked how well the system worked, so I ran them with a few minor mods because I just can’t run stock anything without improving on the system. At least until we switched over to Shimano Di2. A sealed system worked the best for racing in all conditions, including the sand in Belgium, plus all the bike washing from training and racing. I would seal the system using glue or silicone to keep it fully sealed from shift lever to derailleur and from brake lever to cantilever brake to prevent water penetration from power washers. This cuts back on shifting issues and the need to replace inner cables after each mud race. If you expose the housing to mud and sand it would chew up the inner lining of the shift housing, which adds a lot of extra work for me. There have been some companies using lined inner cables to help decrease friction, but in all honesty, they have not been durable enough for cyclocross conditions. The most common section of derailleur housing that needed replacing was always the last rear piece that feeds into the rear derailleur. I’d suggest replacing this piece after every mud race if you’re not running a fully sealed system. It’s cheap and easy to replace. I’ve run pretty much every type of cable system out there, and I would always end up running a cobbled together system of cable liners and ferrules to seal the cables. We buy Shimano Di2 for a number of reasons. The shifting is consistent and perfect for every shift. If there’s a problem with the shift, it’s usually a mechanical problem like a bent derailleur hanger, mud or grass in the cassette or I’ve set up the shifting too fast in one direction which causes it to be too slow in the other direction under load from pedaling. 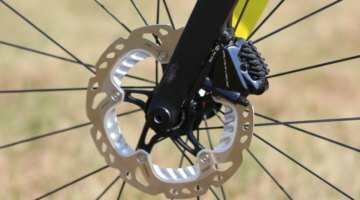 One of the features of Shimano Di2 is I can program certain custom functions like the speed of the shift and how many gears the rear derailleur will shift if the button is held down. I can also fine tune the trim for the front derailleur perfectly and it never goes of out of adjustment. Because I learned this the hard way, I always unplug the cables from the battery when we travel. Three years ago we drove to Woerden, NL for a night-time race. One of the shift levers was constantly depressed after the bike shifted in the van so it ran the battery down to almost empty. Unfortunately, the battery died on the last lap of the race while Katie was leading. The default for a flat battery is for the derailleur to stay in a very easy gear. Katie was stuck in her 36×28 for the last half lap after she passed pit two and was passed by Ellen van Loy in the last 100 meters of the race. Since then I always unplug the bikes while we’re driving to the race and re-check the battery before the race. 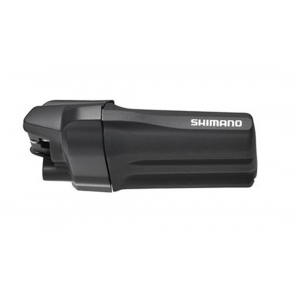 If I see the battery is flashing a green light instead of a solid green light, I top up the battery using the Shimano charger cable and a portable USB power pack I bring to every race. Want more advice on bike maintenance? Check out our Mechanical Monday archives.